With the threat of Islamist attacks plaguing the country, operating a mine in Mali is not for the fainthearted. Numerous foreign nationals have been kidnapped over the past five years and Mali-based militants have directly targeted Western companies both domestically and in neighbouring states. Compounding these problems is a weak government, with civilian rule having only been restored in 2013 after a coup the previous year. Despite this period of regional jihad and massive political upheaval, several international mining firms have continued to operate relatively unhindered in the gold-rich regions of Kayes and Sikasso in the south of the country. Indeed, gold mining in Mali is becoming ever more attractive following a series of positive developments for the sector. Suicide bomb attacks and mass shootings outside northern Mali are still most likely to target the capital Bamako. Last month, Mali upgraded its estimated reserves by a third to around 800 tonnes, which should ensure continued production for at least the next 15 years. Moreover, only a handful of Mali’s 133 potentially gold-rich sites have been mapped out, and the rising gold price generates new possibilities for exploration in a country with huge untapped potential. Expansion work is already underway at several locations, and financing is in place for the development of the Fekola mine in Kayes – believed to be the largest orogenic gold deposit in West Africa. Production at the 215-tonne deposit is set to begin in early 2017. All of this is happening as terrorist groups extend their reach south of the Sahel and as prolonged political instability continues to cripple northern Mali. Should mining companies be concerned? The threat of kidnappings and terrorist violence targeting foreign nationals will persist so long as Islamist militants retain a strong foothold in northern Mali. Though recent high-profile terror attacks have focused on hotels and restaurants in cosmopolitan locations across West Africa, networks such as al-Qaeda in the Islamic Maghreb (AQIM) and al-Mourabitoun can also penetrate large, well-protected industrial sites. Last month, Mali upgraded its estimated reserves by a third to around 800 tonnes, which should ensure continued production for at least the next 15 years. For instance, al-Mourabitoun was able to deploy more than 30 militants in its attack on the Tigantourine gas facility in southern Algeria in January 2013. Over 800 employees were taken hostage in the incident. Nevertheless, the likelihood of a Tigantourine-style assault occurring at a mine in southern Mali is remote. While both AQIM and al-Mourabitoun have repeatedly demonstrated the capacity to launch attacks beyond their immediate supply lines, these operations typically rely on small numbers of individuals perpetrating suicide bombings, kidnappings and mass shootings. Deploying a convoy of armed vehicles containing 20-30 militants in Mali’s better-protected southern regions without being detected would be an altogether different prospect. The arrest last month of Souleymane Keïta, leader of militant group Ansar Dine’s southern cell, illustrates the lack of a robust support network for Islamists in southern Mali. The group’s spate of attacks on security forces in Sikasso and Koulikoro in June 2015 had raised fears that jihadi militants could destabilise the country’s mining regions. However, Malian forces were able to stamp out the offshoot before it could develop a resilient support base and perpetrate further assaults. Keïta’s capture near the Mauritanian border, while reportedly travelling to Timbuktu in northern Mali, marks a significant victory for the authorities in preventing the unit recoalescing. 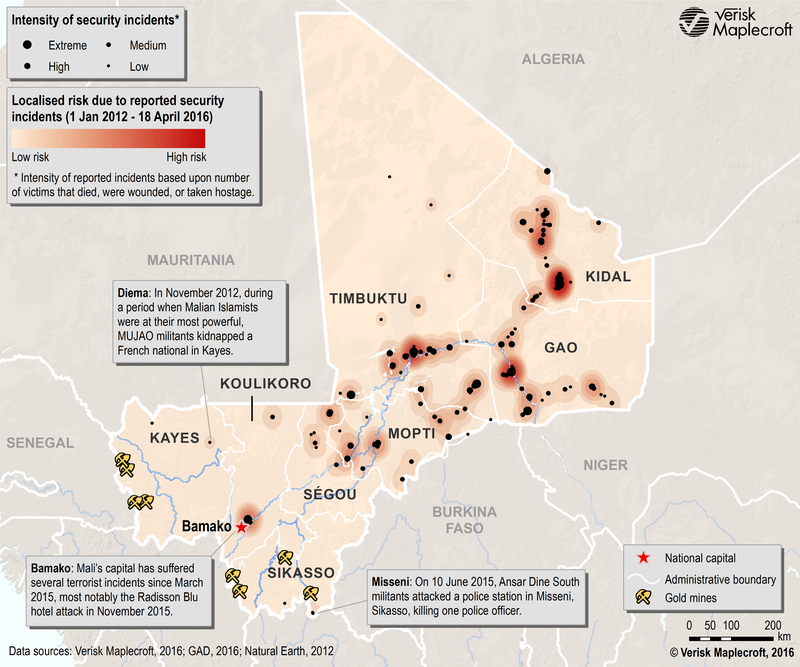 The tenuous Islamist capacity in the south reduces − but does not eliminate − the kidnap risk in Mali’s mining areas. AQIM or al-Mourabitoun would have great difficulty holding captives in southern Mali because of the widespread hostility among local populations towards the groups. Any kidnap attempt at a mine in Kayes or Sikassso would thus almost certainly require the immediate transportation of the hostages northwards to the sparsely populated desert, most likely via Mauritania. But having to travel vast distances and escape from Mali’s moderately well-controlled south would increase the chance of detection by the police or border authorities, as Keïta’s arrest in Kayes shows. By contrast, the risk of kidnapping or a large-scale attack is significantly higher at mines in neighbouring countries within striking range of northern Mali. For example, senior UN officials working in Mali told Verisk Maplecroft last month that a major terrorist attack on a mine in northern Burkina Faso would be “entirely feasible”. The region’s immediate proximity to northern Mali, where Islamist groups’ operational capacity is at its strongest, combined with insufficient patrols on both sides of the border, makes it especially vulnerable. Suicide bomb attacks and mass shootings outside northern Mali are still most likely to target the capital Bamako, where there are high concentrations of foreign nationals in weakly secured locations. However, the possibility of an attack at a mine cannot be discounted, meaning that mining firms will continue to incur security costs for the foreseeable future. But for companies with a high tolerance for risk and the ability to implement advanced protective measures, Mali’s untapped gold reserves can represent a lucrative investment.